Donald Drummond Fraser was born at Sherbrooke, Guysborough County on November 14, 1895. The second of five children in the family of Alfred W. and Christina “Tina” (Murray) Fraser, Donald’s parents were Pictou County natives. The Fraser family was active in mining operations at Goldenville, where Alfred was employed at the time of his 1893 marriage. 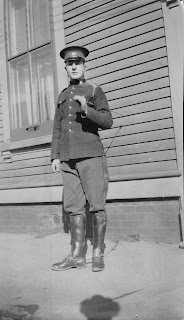 Both Donald and his older brother, Alexander Murray, enlisted for overseas service with the 6th Battalion, Canadian Mounted Rifles, at Amherst, NS on March 30, 1915. Donald had commenced training with the unit in early February and earned a promotion to the rank of Corporal prior to his attestation. Six weeks after completing their attestation papers, the siblings were transferred to the 55th Battalion (New Brunswick) and accompanied the unit to Camp Valcartier in mid-June. Within days of their arrival, military officials assigned the brothers to a reinforcement draft destined for the 1st Battalion (Western Ontario). The draft departed Quebec on June 19 aboard SS Corsican and arrived in England nine days later. Temporarily assigned to the 12th Reserve Battalion, both brothers received promotions in August. Donald advanced to the rank of Lance Sergeant—a Corporal acting in the rank of a Sergeant—and was confirmed in the full rank of Sergeant before months end, while Murray was appointed Lance Corporal. Officially transferred to the 1st Battalion on August 27, Donald and Murray crossed the English Channel to France the following day and joined the 1st Battalion in the field on September 4, 1915. The 1st was one of the Canadian Expeditionary Force’s most experienced battalions, having crossed the North Atlantic in October 1914 as part of the 1st Canadian Contingent. Assigned to the 1st Division’s 1st Brigade, the unit crossed to France in early February 1915 and entered the trenches of Belgium’s Ypres Salient alongside the 2nd, 3rd and 4th Battalions—all Ontario units—before month’s end. Throughout the winter and spring of 1915 - 16, Donald and Murray served with the 1st Battalion in the Belgian trenches. Their first introduction to major combat occurred in June 1916 at Mount Sorrel, where Murray was amongst the unit’s fatalities. Donald followed the 1st to the Somme in August 1916 and was promoted to the rank of Company Sergeant Major—his Company’s senior-ranking non-commissioned officer—the following month. He was two months shy of his twenty-first birthday at the time. While not involved in the Canadian Corps’ major Somme battles, the 1st suffered considerable casualties during its tours near Courcelette and Regina Trench. The unit followed the Corps northward to sectors near Vimy Ridge, where its soldiers served throughout the winter of 1916 - 17. As spring approached, the Canadian units prepared for their assault on Vimy Ridge, scheduled for early April 1917. The 1st Division occupied the right flank of the Canadian Corps’ line at Vimy, its units having to cover the longest distance to reach the village of Farbus, their final objective. On the morning of April 9, 1917, the 1st Brigade occupied support positions behind the 2nd Brigade, which launched the initial phase of the attack at 5:30 a.m. and secured its first and second objectives within two hours. The 1st, 3rd and 4th Battalions then passed through their lines and advanced toward the village of Farbus and an adjacent wooded area. By mid-morning, the 1st Battalion had captured its final objective and set about consolidating its position. Personnel remained in the line for two days following the advance, the last of its soldiers retiring during the night of April 12/13. The 1st reported two Officers killed and four wounded during the tour, while 47 of its “other ranks” (OR) were killed, 156 wounded and 26 missing following the battle. 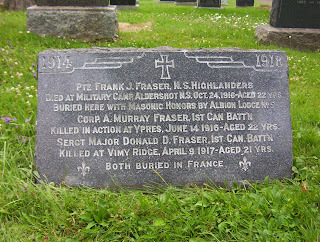 Company Sergeant Major Donald Drummond Fraser was one of the first day’s casualties, “severely wounded by an enemy shell immediately after his Company had reached their objective.” He was evacuated to No. 6 Casualty Clearing Station, where “he succumbed [to his wounds] on April 12, 1917.” Donald was laid to rest in Barlin Communal Cemetery Extension, France. 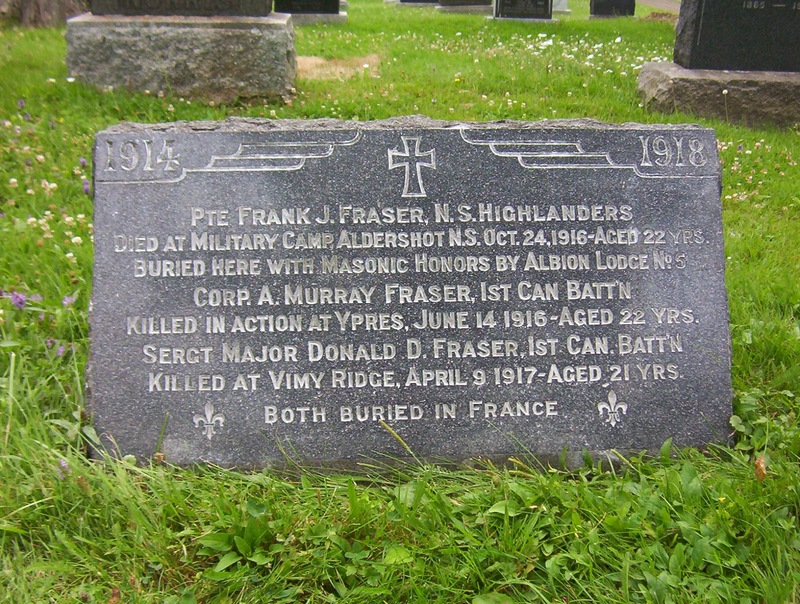 Fraser Memorial stone, Lorne St. Cemetery, New Glasgow, NS. Detailed summaries of Murray and Donald Fraser’s stories are among the 72 profiles included in First World War Honour Roll of Guysborough County, Nova Scotia, Volume I: 1915 - 1917, available online from Bantry Publishing.